At ERSRI, we understand that it can be difficult to navigate through the rules and regulations when trying to determine when you can retire and the amount of your monthly pension benefit. If you are planning to retire in the next 12 months, you may want to review ERSRI's Retirement Planning Checklist. We’ve gathered a list of the most common questions we hear from our members and answered them below. If you would like guidance on how to complete your retirement forms, please click here. If you have additional questions, ERSRI Customer Service Representatives are available Monday - Friday, from 8:30 a.m. to 4:00 p.m. at (401) 462-7600. You can also contact ERSRI by e-mail by visiting our Contact Us page. What is the Employees’ Retirement System of Rhode Island Retirement Benefit? I’m Thinking about Retiring… What Should I Do Next? How do I log into and use my ERSRI Online Retirement Account? I have a question about the data in my online retirement account. What should I do? Can I designate or change my beneficiary? What are My Pension Payment Options When I Retire? I am leaving Employment Prior to Retirement Eligibility. What Happens? What is the Rule of 95? I’m getting a divorce. How will this affect my pension benefit? I keep hearing the term “vested.” What does that mean? How do I find out how much money I’ve contributed so far? Will my survivors receive a death benefit? What is the Teachers Survivors' Benefits Plan? Why is my ERSRI ID number different than my Employee ID number? For State employees, the Office of Employee Benefits offers no-cost financial wellness resources, ranging from in-person fairs and workshops to online tools. Q. What is the Employees’ Retirement System of Rhode Island Retirement Benefit? Most members of the Employees’ Retirement System have a hybrid benefit plan made up of a Defined Benefit plan and a Defined Contribution plan. What’s a Defined Benefit Plan? A Defined Benefit Plan pays you a specific amount of money per month for the rest of your life when you are eligible to retire. The amount of your monthly pension benefit is based on several criteria including when you were hired, how long you have worked, and your salary. What is a Defined Contribution? The Defined Contribution plan allows you to save money for your retirement in a tax-deferred account that is similar to a 401k plan. Both you and your employer contribute a percentage of your salary to your Defined Contribution plan. TIAA invests these funds on your behalf and as you instruct and when you retire, you are able to begin withdrawing these funds. Q. I’m Thinking about Retiring… What Should I Do Next? Take a look at our Retirement Planning Checklist for step-by-step instructions on how to collect your ERSRI retirement benefits. ERSRI members can log into their online accounts here. First time users can self-register online as long as you have an email address on file with ERSRI. If you don’t have an email address on file or if you need assistance logging in or setting up an online account please contact us using our Contact Us page or by phone at 401-462-7600. Once you’ve logged into your online retirement account you can update your phone and email address, review your pension account information, and receive your estimated retirement eligibility and estimated pension benefit amount. To learn more about how to use your online account please click here. Q. I have a question about the data in my online retirement account. What should I do? If you have a question about your online retirement account including any problems accessing the pension projection tool, please contact us using our Contact Us page or by phone at 401-462-7600. You may change your beneficiary at any time by completing a Beneficiary Designation Form, and mailing or faxing it to ERSRI at (401) 462-7691. Q. What is a "Schedule"? Schedules are determined by when you were hired, how many years of service you had and your age at certain points in time. Each schedule has different rules used to determine your retirement eligibility date, your accruals and service credit factor and your pension benefit calculation. Q. How is My Pension Benefit Calculated? Your pension calculation is based on several criteria including your years of service credit and your highest average salary. Service Credit Factor: Each year you work for a participating employer, you accrue a percentage of your salary (your accruals) which are added together to determine your service credit factor. For example, if you had a 1% accrual per year and worked for 30 years your Service Credit Factor would be 30%. Highest Average Salary: Depending on your accrual schedule, ERSRI will use the average of your highest 3 or 5 consecutive years of salary to calculate your pension benefit. 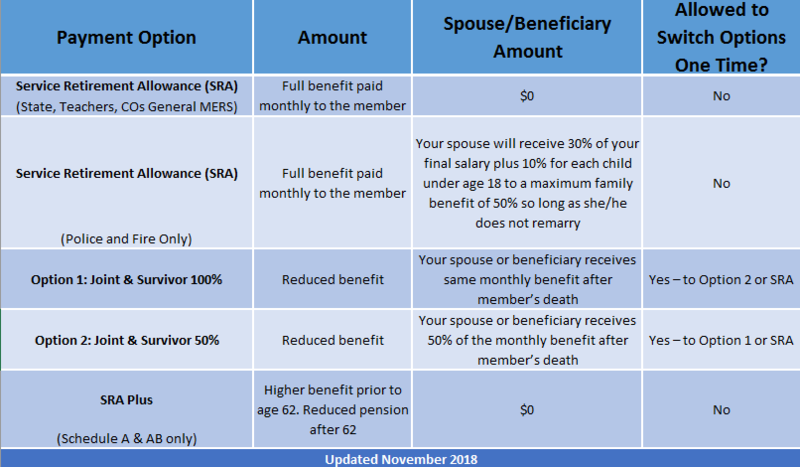 Annual Pension Benefit Calculation: ERSRI multiplies your Service Credit Factor by your Highest Average Salary to determine your annual pension benefit amount. Q. What are My Pension Payment Options When I Retire? Q. Are you Leaving Employment Prior to Retirement Eligibility? If you leave your job and terminate employment with a participating employer but are vested in the system (currently 5 years of contributing service), you may begin collecting your pension benefit when you meet your retirement eligibility criteria — as long as you do not withdraw your contributions. In some cases, your eligibility date may be adjusted if you leave employment prior to reaching your retirement date. However, your benefit will be the same as it was the day you terminated employment. There are options to receive your benefit prior to reaching your full eligibility date but those options require a reduction of your benefit. It is important to know that once you leave active employment, ERSRI will not automatically begin sending your pension benefit once you are eligible to collect your benefit. It is your responsibility to notify ERSRI of your eligibility and to fill out a retirement application approximately three to six months before you are eligible to begin collecting your benefit. If you do not apply for your pension benefit when you first become eligible, you will not receive retroactive benefits to the date when you were initially eligible. Deferred benefits are payable beginning on your eligibility date or on the first of the month in which your completed application is received by ERSRI, whichever is later. Q. What is the Rule of 95? The Rule of 95 is an alternative full benefit retirement eligibility date to allow members to retire earlier than their schedule-based eligibility date. Under the Rule of 95 members can retire when their age plus their years of service equal 95 provided that they are at least 62 years old. For example, a member who is 62 years old could retire with 33 years of service rather than waiting until their schedule based eligibility date (62 + 33 = 95). Q: I’m getting a divorce. How will this affect my pension benefit? Upon review and qualification by ERSRI, we will follow the instructions outlined in a domestic relations order (DRO) regarding how to pay benefits awarded by the court to your ex-spouse. You should consult with your divorce attorney on how your benefit will be handled. To learn more about the impact a divorce may have on your retirement benefit please click here. Q: I keep hearing the term “vested.” What does that mean? When you are “vested,” you have earned a pension benefit, although you may not collect your benefit until you meet retirement eligibility requirements. Q: How do I find out how much money I’ve contributed so far? A: You can view your contributions by logging in to your online retirement account or by requesting a Statement of Contributions from ERSRI at 401-462-7600. Q: What are service credits? State and municipal employees earn one year of “service credit” for each full year that they work and contribute to the retirement system. Service credits may be purchased in certain instances; for additional information about service credits and their purchase, please contact ERSRI using our Contact Us page or by phone at 401-462-7600. Q: What is the Teachers Survivors' Benefits Plan? The Teachers Survivors' Benefits (TSB) Plan are for Teachers, in participating school districts, who contribute to the fund, in lieu of Social Security, to provide benefits for their survivors in the event of their death. To learn more about how the TSB Plan works, please see Teachers Survivors' Benefit Information. Q. Why is my ERSRI ID number different than my employee ID number? ERSRI assigns each member a unique ID number when they join the retirement system. Your ERSRI ID number will follow you if you move to a different participating employer and will always be the number that ERSRI uses to identify your account. It is not the same as an employee ID number that your employer may assign you.